Get All 5 Woodshedd Releases 40% Off! Aurora Borealis / Evolutions / What If The Moon Were Made Of Jazz. 62:08.
moved back to New York and immersed himself into that city’s free jazz loft scene. passed away a month before he was to put on a week’s residency at The Stone. It makes sense that Matt’s Mode by MATT LAVELLE QUARTET on UNSEEN RAIN is on UK VIBE Top 20 Modern Jazz ‘compositions’ of 2017. Matt is the epitome of the jazz composer whose music is designed to bring out the best in improvisers with an eye on the entire history of jazz. Matt himself is not fond of top 10/20 lists, but we at Unseen Rain are very fond of this one. You can get MATT LAVELLE QUARTET at HD TRACKS or here: MLQ. Rocco John Iacovone, alto & soprano saxophone/piano; Ras Moshe Burnett, bells/tenor saxophone/flute; Sana Nagano, violin; Michael Lytle, bass clarinet; Rich Rosenthal, guitar; Phil Sirois, bass; John Pietaro, percussion; Dalius Naujo, drums. Rocco John Iacovone has long been a major influence in New York’s improvisatory musician’s community. As a student of Sam Rivers and Lee Konitz, his alto and soprano saxophone talents reflect Avant Garde inspiration. He founded the Improvisational Composers Ensemble (ICE) as an outlet for music specific to featuring improv as a major compositional element. “Peace and Love” is his fourth album as a leader and composer. His ensemble generously reflects the premise of freedom and creativity. They band together to compliment his original music, with ample time given each musician to express themselves within each suite. This recording was made “Live” inside “the Stone” (John Zorn’s place) to a standing-room-only audience. It is dedicated to the memory of Will Connell, who had encouraged Rocco’s residency and ultimate recording venture, but passed away November 19, 2014, before he could witness the dream come to fruition. Connell received a CAPS grant for orchestral composition and as a copyist/arranger/sideman, Will Connell worked for musicians ranging from Stevie Wonder and Roberta Flack to Horace Tapscott, Sam Rivers, Elton John, Rahsaan Roland Kirk and King of Pop, Michael Jackson. ONE MAN’S JAZZ RADIO SPINS ROCCO JOHN – along with other great artists. 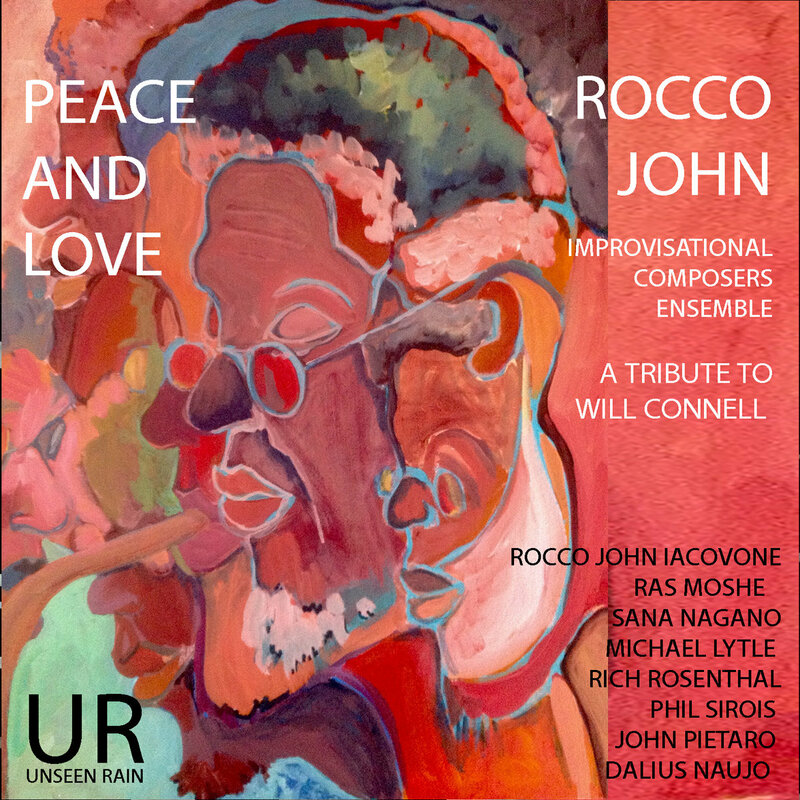 LISTEN HERE to ROCCO JOHN’s Evolutions from his UNSEEN RAIN release PEACE AND LOVE on ONE MAN’S JAZZ RADIO. Wings / Escape / Circuits / Dial Up / Tango / Whispers / 72’s / Wings (Epilogue). 67:54. Rocco John Iacovone (as, ss), Rich Rosenthal (g), Francois Grillot (b), Tom Cabrera (d). March 2015, Riverdale, NJ. What’s not to like about a fine quartet of superb but under-appreciated players working that sweet spot between post-bop and the outside? The date opens up with a nice tasty drum spotlight, followed by the leader’s fulsome alto lines, both fleet and tart. In time, they cede the spotlight to the excellent Grillot and Rosenthal, whose clean tone and buzzing lines I really dug, not least because they make for an excellent contrast with Iacovone throughout. Some vigorous, bustling post-bop ensues on the exuberant “Escape,” whose loping unisons move through a nice series of overlapping lines, bobbing up and back, with slight intensities welling up here and there. The further one gets in listening to this group, it’s not too unlike one of Joe Morris/Rob Brown’s more inside dates, at least in terms of the compositional/structural approach; the actual instrumental languages differ, as is obvious on the stair-stepping “Circuits,” where Rosenthal’s nimble, inventive playing brings some serious energy. He and Iacovone romp on the funky, shuffling “Dial Up” and are equally impressive on the abstract, balladic “Tango” (which only hints at its musical inspiration). “Whispers” meanders just a bit to my ears, though it’s certainly filled with nimble playing and excellent instrumental interaction – perhaps just not enough thematic meat for what these guys are trying to accomplish. Things are very much back on track with “72s,” where the fabulous work from Grillot and Cabrera sets up some of the record’s finest improvising from the leader and the guitarist. Closed out by a nice, mid-tempo second version of “Wings,” it’s a strong date overall. Swing / Moonflower Interlude / Faith. Sawyer, d; Anais Maviel, vcl. 11/14, Brooklyn, NY. SUMARI‘s second release SUMARI II, from the powerful trio of multi-instrumentalists Matt Lavelle on trumpet and alto clarinet, Jack DeSalvo on electric guitar, cello, banjo and bass ukulele and Tom Cabrera on drums and percussion, go one step further than their debut album SUMARI (one of Downbeat‘s Best Albums of 2015) in creating vast soundscapes alternating with intense interplay. Born in Paterson, New Jersey, in 1970, previously alongside William Parker and being responsible for the rebirth of a genuine original, Giuseppi Logan, a few years ago , Matt Lavelle directs the 12 Houses, an important work, recorded in November 2014, featuring an ensemble of sixteen elements expressing, in the first instance, a vaguely Mingus-like approach (all Lavelle compositions) staring with a rather excited and consequential tenor sax solo. Soon after, however, comes an exquisite chamber interlude with flute/vibes/arco bass that disrupts the our initial expectations. It goes something like this for the entire disk, including crescendo and decrescendo, a new tenor solo on which the orchestral is vehemently grafted intermittently (Brooklyn Mountain), then the voice, though cooking on quite a different temperature, is articulate and full of purpose (Knee Braces). This is reiterated by the excellent violin solo that follows and lies on flexible yet calibrated orchestral strokes. The director Lavelle becomes the main actor in “Cherry Swing,” followed by banjo spice, an important element throughout the entire album, and bassoon, in short, which is quite unusual during “Moonflower Interlude,” and then piano, in the much larger “Faith” that seals (not without some fleeting academics) the move toward a happy closing. Track Listing: Solidarity; Brooklyn Mountain; Knee Braces; Cherry Swing; Moonflower Interlude; Faith. Personnel: Matt Lavelle: cornet, flugelhorn soprano, alto clarinet, run; Lee Odom: soprano sax, clarinet; Charles Waters: alto sax, clarinet; Ras Moshe Burnett: saxophone (tenor and soprano), flute, bells; Tim Stocker: saxophone (baritone), bass clarinet; Mary Cherney: flute, piccolo; Claire de Brunner: bassoon; Laura Ortman: violin; Gil Selinger: cello; Anders Nilsson: Guitar; Jack DeSalvo: banjo, mandola; Chris Forbes: piano; John Pietaro: vibraphone, percussion; François Grillot: bass; Ryan Sawyer: drums; Anaïs Maviel: voice. There’s a majestic feeling to the opening of Solidarity, the title track of a release by Matt Lavelle’s 12 Houses. This reed-heavy 17 piece ensemble also features an extended rhythm section with guitar, piano, banjo, bass, vibes, and drums, along with violin, cello and voice. Some of the places that conductor/composer Lavelle has his unit visit are not unexpected, like saxophonists popping out of the ensemble for brash solos amid flowing and changeable backdrops. But Lavelle is a wily musical organizer who nudges the group into some unexpectedly quiet zones as well as whip them up into a frenzy like the exhilarating last minute of Solidarity. Clearly this is a man who knows well the capabilities and the sounds of the members of the unit. Brooklyn Mountain, which sounds like an excerpt from a longer performance, offers extended interplay among pianist Chris Forbes, tenor saxophone soloist Ras Moshe, and the mass of horns brought in and out of the picture via Lavelle’s conducting. Violinist Laura Ortman and cellist Gil Selinger are prominent on the ethereal but thorny Knee Braces, cushioned by thick swirls of chords from massed reeds and understated rhythms. This partly improvised tone poem is largely soothing and restful, especially when contrasted with some of the other tracks. Lavelle puts on a show for the opening two minutes of Cherry Swing, with a lengthy, cogent, and wide-ranging cornet solo over minimalist percussion accompaniment. When the full band kicks in with a wallop, Lavelle takes a second solo, playing with fiery, rapid-fire gusto. He’s followed by Jack DeSalvo with an ornery banjo solo before the ensemble pours back in to make a mighty noise. While Anaïs Maviel’s voice is usually used as part of the ensemble, her unhinged vocals on the finale, a warped New Orleans-styled collective improvisation are a bit unnerving. But a little shaking up is good for you, at least musically speaking, and if you’ve made it this far, you’ll be having too good a time with Chris Forbes’ rollicking piano and the rhythmic bounce of bass and percussion to be bothered very much. Solidarity presents an unusual big band in a variety of stylistic approaches, held together by Lavelle’s vision and his command of the possibilities of his group. Definitely worth a listen. Unseen Rain UR-9945; Matt Lavelle (cnt, fl, alto cl) Lee Odom (ss, cl) Charles Waters (as, cl) Ras Moshe Burnett (ts, ss, fl, bells) Tim Stocker (bars, bcl) Mary Cherney (fl, picc) Claire De Brunner (bassoon) Chris Forbes (p) Laura Ortman (vln) Gil Selinger (clo) Anders Nilsson (g) Jack DeSalvo (bjo, mandola) John Pietaro (vib, perc) François Grillot (b) Ryan Sawyer (d) Anaïs Maviel (vcl); Brooklyn, NY, November 2014; Solidarity/ Brooklyn Mountain/ Knee Braces/ Cherry Swing/ Moonflower Interlude/ Faith; 48:53. Contrassio Trio perform Jack DeSalvo’s piece Pramantha in Palencia, Spain. Pramantha has also been performed by classical guitarist ADAM KAHN in the UK. Oh, acoustic guitar duo, how my heart beats for thee! DeSalvo and Minasi are a great pair on Soldano Dieci Anni, both performing on either unamplified archtop guitar or acoustic (classical and steel string) guitar. They split the responsibilities, supporting each other, and creating space for stretching out, sometimes freely, and other times within well-defined chord structures. Starting with the ‘Bee and the Fly’, a free and playful number that never loses steam, the pair moves from jabs of chords, to frenetic runs, to lush arpeggios, all without losing a beat – or rather it would be more appropriate to say – never losing the pulse. The tight number ‘Angela’ is a lovely mid-tempo ballad, buoyant and easy-breathing, with crisp solos from both (the vocals caught by the ambient recording are a tiny bit distracting, but also endearing). Even at their most out, you can trust in the capable hands of DeSalvo and Minasi to deliver a captivating performance. Bassist Mark Hagan recording “All Hallows” with Tom Cabrera – drums and Bob Rodriguez – piano for Tom’s upcoming UNSEEN RAIN album – working title is “What I’ve Found”. Recording and mastering engineer is Jim DeSalvo, producer and composer is Jack DeSalvo, mixing engineer is Larry Hutter and studio is Trading 8s in Paramus, NJ. A two-guitar duet album with Dom Minasi and Jack DeSalvo? I was not sure what that would be until I put it on. Soldano Dieci Anni (Unseen Rain) is a hugely beautiful surprise. The both of them brought their acoustic-electrics, archtops, flattops and Jack a nylon string guitar. They let loose with some nicely done free numbers then proceeded to tackle their originals. Fact is, Dom and Jack hit it off from the beginning. Their ability to swing and come up with great lines is heightened when the two play off against one another. The ravishing harmonies of the originals combine with inspired note choices for some of the nicest acoustic duets since side two of McLaughlin’s My Goals Beyond. They show deep roots, great subtlety, advanced interactions and the kind of spontaneity that an album like this demands. Hats off to Dom and Jack! Bravo! Altoist Rocco John is a fixture on the New York scene, keeping the new thing free flames stoked with his own brand of avant jazz. He records more infrequently than I would like, but then that makes his new releases all the more welcome. His latest, Embrace the Change (Unseen Rain 9947), features a cohesive and compatible quartet of Rocco John on alto and soprano, Rich Rosenthal on electric guitar, Francois Grillot on contrabass and Tom Cabrera on drums. Rocco John provides the originals, attractive springboards for the often collective improvisations that make good tracks into the horizon. Rocco John sounds quite limber and full of spontaneous musicality. So too Rich makes creative paths that go well with what Rocco John is doing. Francois Grillot is, as always, the complete bassist, whether walking or making horn-like statements. And Tom Cabrera swings and frees it all up well depending on what is needed. It is an album that stays in the avant mode with lots of fire and ideas. It’s well worth hearing, another notch in the Rocco musical belt. Recommended! Big band free jazz is more than discordant noise. Matt Lavelle likes to use the fullest spectrum of instruments as possible. The multi-horns player (cornet, Flugelhorn and alto clarinet) includes 16 musicians on Solidarity, his debut as the leader/conductor of 12 Houses. Lavelle also penned the six originals. Instead of pursuing a typical jazz big band or large ensemble approach, Lavelle focuses on sweeping improvising, with cues provided by his compositional writing. In other words, while there are moments of melodic, lyrical and harmonic construction, there are many more where instrumentalists apply elements of free jazz or open soloing. Lavelle’s preliminary plan was to employ 12 musicians, embodying the 12 zodiacal signs. But he felt he could further supplement his music, so the group enlarged, and the opportunities for a range of sounds widened. This broad technique is heard on the 12-minute title track opener. Massed horns (clarinet, Flugelhorn, saxes, flute, bassoon and piccolo) are balanced alongside piano, a strings unit, guitar, vibes, bass and drums. Different players enter and leave during the lengthy tune, so sometimes the horns drop out, or the rhythm section is spotlighted. Throughout, there are striking touches from the horns, strings and rhythm instruments, which span from bright to dissonant. There is close to a constant sense of eddying as the band progresses from slow to a quicker pacing, and various solo or smaller instrument groupings create distinct portions among the greater whole. One of the standouts is the nine-minute “Cherry Swing,” a tribute to the late Don Cherry, who initially came to prominence with Ornette Coleman but whose perceptions on improvisation came to the fore on his solo releases. “Cherry Swing,” Lavelle says, “represents the absolute core of my personal philosophy that free jazz never abandoned everything that made jazz what it is. Free jazz, set jazz free to be itself. Everything that makes jazz what it is, and why it’s so great, is even more important to strive for in free jazz.” Lavelle is upfront on cornet, emulating and echoing Cherry’s manner and musical viewpoint, while bass and drums craft a swinging foundation. Vibes are lower in the mix, inserting coloring to the percussive perspective. Banjo appears as well when Jack DeSalvo solos. For the most part, “Cherry Swing” is not a bigger-band setting, although the horns come in toward the conclusion to supply a discordant ending. Another memorable piece is “Knee Braces,” which indicates Lavelle’s issues with knee problems. The nearly ten-minute “Knee Braces” has a melancholy, almost dark nature exemplified by the reflective introduction. The arrangement becomes truly haunting when violinist Laura Ortman takes over, with extended dim tones which are at times reiterated by Gil Selinger’s cello. Ortman shapes a tender emotional magnetism throughout “Knee Braces,” even when other strings and the horns are occasionally utilized. Minimalism is supported on the brief, 2:51“Moonflower Interlude,” a solo spot for bassoonist Claire de Brunner. Lavelle states, this “is a song sung by a secret society of little white flowers that only bloom in the moonlight.” The most poignant piece is the 9:33 “Faith,” dedicated to Lavelle’s mother, who miraculously survived three brain surgeries before passing away (webmaster’s note: Matt’s mom is very alive presently) Chris Forbes’ introductory piano sets the mood, which sways from peaceful remembrance to a hymn-like invocation accentuated by hand-clapping, Anaïs Maviel’s non-verbal voice, and DeSalvo’s banjo; and from frictional improvising to lyrical asides. Everyone in the ensemble contributes to build up a celebratory responsiveness. Forbes’ gentle solo piano adds the finishing sensitivity. “Faith” is a fully-formed sketch of a deeply-loved personality, and comprises the many feelings one has when thinking about an individual’s life. On Solidarity, Lavelle’s ambition to incorporate composition and improvisation, to stay true to his central philosophy, and to balance melodicism with free jazz has resulted in a commanding debut for his 12 Houses group. TrackList: Solidarity; Brooklyn Mountain; Knee Braces; Cherry Swing; Moonflower Interlude; Faith. Email your Opinions on this article to AUDIOPHILE AUDITION! Born in Paterson, New Jersey, in 1970, having played alongside William Parker and and being responsible for the reintroduction of the inimitable Giuseppi Logan a few years ago, Matt Lavelle directs this valuable work, recorded in November 2014, an ensemble of sixteen elements denoting, in the first instance, a vaguely mingus-like approach (with all Lavelle themes) beginning with a rather excitedly flowing tenor sax solo. Soon after, however, comes an exquisite chamber interlude of flute/vibes/arco bass that disrupts our initial expectations. It goes something like this for the entire disk, including crescendo and decrescendo, a new tenor solo vehemently grafted on the intermittent orchestral body (“Brooklyn Mountain”), then the voice, though producing quite different temperatures, purpose and articulation ( “Knee Braces”), reiterated by the excellent violin solo that followed, laying on plastic and calibrated orchestral strokes. The receiver Lavelle is thenthe main protagonist in “Cherry Swing,” followed by spicy banjo,which is evidentNot negligible throughout the entire album, and bassoon, which, in short, is quite unusual in “Moonflower Interlude,” and then piano, with traces of classicism, in the much larger “Faith” that seals the work in the sign of a happy closing tension, . Personnel: Matt Lavelle: cornet, flugelhorn soprano, alto clarinet, run; Lee Odom: soprano sax, clarinet; Charles Waters: alto sax, clarinet; Ras Moshe Burnette: saxophone (tenor and soprano), flute, bells; Tim Stocker: saxophone (baritone), bass clarinet; Mary Cherney: flute, piccolo; Claire de Brunner: bassoon; Laura Ortman: violin; Gil Selinger: cello; Anders Nilsson: Guitar; Jack DeSalvo: banjo, mandola; Chris Forbes: piano; John Pietaro: vibraphone, percussion; François Grillot: bass; Ryan Sawyer: Battery; Anaïs Maviel: voice. New York City quartet which promotes changes, all sorts of changes. Rocco John studied with Lee Konitz and Sam Rivers, and learned composition from Nadia Boulanger; that education and his many years as an active member of the NYC jazz community has honed his abilities as performer and writer; and as collaborator and leader. All of Rocco John’s skills and talent fuse on this creative outpouring, where he is joined by other New York artists: guitarist Rich Rosenthal (who operates his own ensemble and has credits which include Mark Dresser, Joe McPhee and Dom Minasi); double bassist François Grillot (who also runs his own band and has worked with Jason Hwang, Daniel Levin and others) and drummer Tom Cabrera (who co-founded the Julie Lyon Quartet with his wife; and has recorded with other Unseen Rain label mates). Spirituality and belief is the focus of “Dial Up.” Iacovone discloses the eight-minute number “represents calling for assistance from the universe.” While the title implies an older conveyance of communication, “Dial Up” is modern creative music with an ear to the present, past and future all at once. Rosenthal’s lighter tone settles his guitar back a bit in the mix, while Rocco John’s sax is upfront and spotlighted throughout. Cabrera and Grillot sustain an advanced rhythmic approach which furnishes an off-kilter mannerism which befits this ever-moving composition. Another tune which links individuals to the cosmos is the longest piece, called “72s,” which Iacovone simply states, is a “connection to the Endless.” This track affords plenty of space and room for crisscrossed musical patterns which blend free jazz, post-bop, open improvisation and more, fashioning the album’s most comprehensive and multifaceted tune. One notable spot is a middle section where Rosenthal takes a fluid solo accentuated by Grillot’s beautiful arco bass. The Rocco John Quartet conclude as they begin, with an alternate rendering of the opening track, the 7:51 “Wings (Epilogue).” While this version is different from the first one, it shares the same attitude of nonconformity and inventiveness. Embrace the Change may be a smidge discordant or jarring at times, but it’s not harsh or rasping, and everything about the band’s methodology contributes to the perception that this is music that is intentionally open-minded and celebratory, but determinedly not strident or piercing. TrackList: Wings; Escape; Circuits; Dial Up; Tango; Whispers; 72s; Wings (Epilogue). DOM MINASI and JACK DeSALVO, two jazz guitarists at the top of their game, have been longtime fans of each other – but have never played together. On an afternoon in November of 2015, the two players sat down in the intimate open space at Beanstudio and recorded SOLDANO DIECI ANNI using several of their favorite acoustic and electric instruments. The resulting recording, intimate yet open and colorful, is a must-have for anyone interested in modern jazz guitar. Available for Download in HD, CD-quality and high quality mp3 starting Friday, June 17 at www.unseenrainrecords.com and www.meyefi.com. Matt Lavelle, cornet/flugelhorn/alto clarinet & conductor; Lee Odom, soprano saxophone/clarinet; Charles Waters, alto saxophone/clarinet; Ras Moshe Burnett, tenor and soprano saxophone/flue/bells; Tim Stocker, baritone saxophone/bass clarinet; Mary Cherney, flute,piccolo; Claire de Brunner, bassoon; Chris Forbes, piano; Laura Ortman, violin; Gil Selinger,, cello; Anders Nillson, guitar; Jack DeSalvo, banjo, mandola; John Pietaro, vibraphone, percussion; François Grillot, double bass; Ryan Sawyer, drums; Anaïs Maviel, voice. The first song Is dark, full of strings and horns that remind me of gardens packed with honey bees and flies. The instrumentation encourages strings to be bowed and tones to be bent. Consequently, they sound very much like insects to me. It’s titled “solidarity”, the same as the CD. The composer must have had something specific in mind, but I probably would have titled it, ‘Spring Garden.’ Lavelle has composed everything on this production. He is the conductor and plays cornet, flugelhorn and alto clarinet. His concept is to hire master jazz players and challenge them to improvise on his musical themes using both traditional, classical instruments. This includes Claire de Brunner on bassoon and Gil Selinger on cello; Ras Moshe Burnett on reeds and Charles Waters on alto sax and clarinet. It’s not an odd premise to throw traditionally classical instruments into the arms of jazz musicians, since jazz is often referred to as America’s unique classical art form. However, this project seems to be melting chamber orchestra and big band music together over an unusual premise of improvisation, freedom and Avant Garde. The song “Faith” gives us a taste of New Orleans verve and Kansas City spicy ‘Swing’. However, the resulting responsiveness between players fosters explosive musicality to interpret Lavelle’s compositional focus. His desire to mix genres is both interesting and challenging. It leaves the final review to be culminated by the ears and in the hands of you, the listener. There’s no telling where Rocco John Iacovone will go. The sax man studied under Lee Konitz and Sam Rivers. In the case of the latter, John has successfully taken the Rivers dictum (if they can’t understand it, go even further!) and whittled away at it, sanding it down, putting on a coat of varnish, to ultimately let his listeners alternately swoon and get excited. Embrace the Change (Unseen Rain Records) is more than a CD title. It’s good life advice. In taking from the avant-garde, but making it accessible, John, whose alto and soprano saxes blow wild and free throughout, has fashioned a terrific one-stop that fills all your needs for melody, harmonics (or, in this case, shall we say harmolodics as taught to us by Ornette Coleman), interaction, composition, fiery hot soloing (check out Rich Rosenthal’s electric guitar!) and the bulwark of a rhythm section — double-bassist Francois Grillot and drummer Tom Cabrera — that not only keeps things kinetic but also anchors the avant and keeps things from getting out of hand. Opening and closing with “Wings,” a post-bop humdinger that challenges our assumptions immediately, the highlights have to be “Dial Up,” an eight-minute plea to the heavens for assistance, and “72’s,” almost eleven minutes of pure disparate intentions, a cross-pollination of ideas from swing and bebop to fusion all in one over-reaching but successful track. You can add the extremely satisfying 9:52 “Tango” to the highlight reel. Recorded in New Jersey, produced by Jack DeSalvo, Embrace the Change works because this particular change is still within earshot of the masses, if only said masses would just lighten up a bit and stretch their brains to the ferreting out of this kind of talent instead of having every musical morsel served to them on a silver platter. C’mon y’all! Up to the task? © 2015 Classicalite All rights reserved. Do not reproduce without permission. From Russia: Great Review of ROCCO JOHN’s EMBRACE THE CHANGE. Alto saxophonist Rocco John Iacovone had excellent teachers, these mentors, however, came from very different places on the musical map. On one hand Rocco played in the brilliant free jazz master Sam Rivers’ Orchestral Explorations, and, on the other he studied with the master of cool-jazz Lee Konitz. His own playing style was formed under the influence of both of these artists. 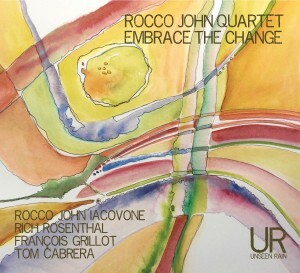 If you find it hard to imagine such a combination, listen to Embrace The Change, the most recent album of the quartet of Rocco John. He founded his first band in 1997 (then it was the trio), and today Rocco John Iacovone is a prominent figure among the avant-garde scene of New York, founder and art director of the Coalition of Creative Artists. Embrace The Change has Rocco playing with Rich Rosenthal, an accomplished guitar player who overcame some early vicissitudes, a New York Frenchman, bassist François Grillot and drummer Tom Cabrera, who is the only one of the four of whom I had heard earlier on his wife Julie Lyon’s album Julie, also published by Unseen Rain Records. All the tracks of Embrace The Change were written by Rocco John, and this is not a random collection of disparate pieces but rather a conceptual suite dedicated to a deeply philosophical theme, the evolution of human existence. Following the ancient Greek sage Heraclitus, who argued that in the same river one can not enter twice, Rocco John defends the idea that the only constant in the evolution of man is eternal movement, eternal change, and to which man can only adapt. By means of music, of course, may seem too abstract a tool for solving this problem, but in the avant-garde, mostly free-form jazz of Rocco John, indisputably genuine feeling is present, not to mention the purely aesthetic pleasure from listening to the playing of this quartet of musicians. I especially would like to mention such compositions as Circuits (the relationship of people living with each other – Rocco provides all the explanations of the songs in the liner notes to this work), Tango, which he described as the dance of life and a very unusual song 72’s (“Communication with infinity” says Rocco John), where the second part suddenly starts to sound background of the famous Jewish song “Eveynu Shalom Aleichem”, which in Hebrew means “We wish you peace”. It is probably not by chance that this wish of peace was included by Rocco John in his suite. If the eclectic and Avant Garde is your cup of tea, sit back and pour yourself a cup of the Rocco John Quartet. Drums and saxophone explode on the scene with intensity and purpose. Every song on this production is composed by Rocco John Iacovone. His bandmates unweave the story inside each composition with sincerity and creativity. The composer says his music is meant to be a comment on our evolution as human beings. I find his music eerie, but strangely beautiful. On a song called “72’s” the drums and cymbals color the presentation as Rosenthal’s guitar astutely explores melodies and emotions. When the sax enters, it brings another character to the forefront and the three begin a sensitive conversation. Musical phrases pour out of them in streams of tempo and scales, spurred by Cabrera’s deft percussion. It sings to me in a minor mode. I am intoxicated by this track. When Grillot bows his bass, it changes the mood and texture of this composition. Each cut on this eight composition album brings a theme of exploration. This is thought provoking music. There is the unexpected, always present and looming in the next musical phrase. Yet, there is also something soothing about this recording. SUMARI at Arts for Art – Video of full performance. ROCCO JOHN QUARTET/Embrace the Change: A saxman that studied under the watchful eyes of some serious hell raisers, he picks up the baton and you can tell this is someone serious about his Sun Ra and didn’t just eat a bunch of BYG records for breakfast one day. Way out in left field, you can tell this is a hark back to the 70 when jazzbos were trying to expand their minds and connect with the universe, progressive tastes will enjoy this well. MATT LAVELLE’S 12 HOUSES/Solidarity: Wow is someone doing a tribute to “Escalator Over the Hill” to kick off the celebrations for Carla Bley’s 80th birthday? The cornet player leads his big band off on some space explorations that feel sincere at the core as opposed to some ruse to grab some arts council money. If space is your place, this is the rocket to ride to get there. The music echoes and reflects nature. The nature squeaks, screeches, hisses and whistles through the velvet yet discordant sounds of the horns as well as through the spacious, frequently tribal sounding rhythms that are constantly active while maintaining a sense of sparsity. Such a reflection can be disastrous, but here, the players approach the recreation of primitivism with reservedness that prevents dispersal. There is a welcomed openness to the recording which invites you to be engulfed by the sonics, rather than being struck by them. Talking with Arts for Art, Matt Lavelle (horns, reeds) discusses his upcoming performance with SUMARI at Justice is Compassion Part 2. Check out the event here! Download SUMARI’s first self-titled album here! Purchase the renowned CD here! JULIE LYON‘s new album MOONFLOWER, her follow-up to the critically acclaimed JULIE, features original songs and compositions and is in many ways her first solo album. Though accompanied by her band, the focus is not only on Ms. Lyon’s considerable vocal talents but also on her role as lyricist and songwriter. The seeds of MOONFLOWER were sown when Julie began to write lyrics to some of composer Jack DeSalvo’s music. It became obvious that recording this music would be the vocalist’s next project and music by Julie Lyon along with additional collaborations with Tom Cabrera and Betsy Serafin create a tapestry of sophisticated listening experiences with music touching new jazz, folk and world music but always rooted in Julie’s sense of swing and the blues. The title song MOONFLOWER is written by multi-instrumentalist/composer Matt Lavelle. Lewis Porter Plays Jack DeSalvo – Lewis recording his newest solo piano album, playing the music of composer Jack DeSalvo. Recorded for Unseen Rain Records by engineer Jim DeSalvo at Trading 8s Studio. New JULIE LYON album MOONFLOWER available this week. JULIE LYON‘s new album MOONFLOWER, featuring original songs and compositions, will be available this week as HD, CD-Quality and mp3 Downloads at www.unseenrainrecords.com and www.meyefi.com.